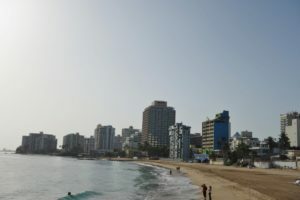 While found on many cruise itineraries sailing from the continental United States, San Juan, Puerto Rico is also home port to a few cruise ships. 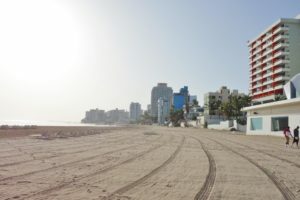 Having ports at two different areas on the island, major cruise lines including Royal Caribbean, Carnival Cruise Lines, and Celebrity Cruises regularly offer cruises departing from San Juan heading to tropical locales in the Southern Caribbean. During our recent Adventure of the Seas cruise, we needed a place to stay prior to sailing. Our ship did have a late day departure from San Juan, but we prefer to fly the day before our cruise to avoid any potential issues. Plus, who doesn’t like to get their vacation started early with a nice pre-cruise stay? 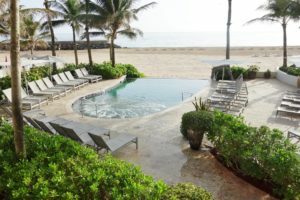 With that in mind, we booked a one-night stay at La Concha Resort, recommended to us by a tour guide during our visit to San Juan earlier in the year. Even though we did not get too much time to spend at the resort, we did get to enjoy a taste of what La Concha has to offer, and it definitely has us wanting to return for more! 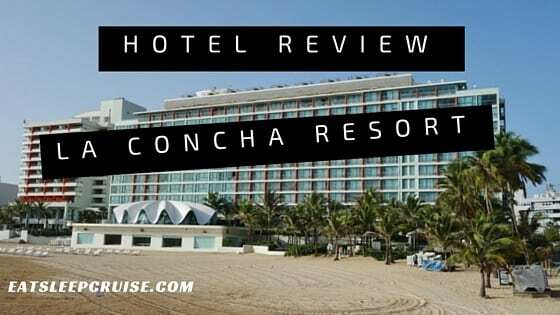 Find out why we are eager to return to this beach front property in this detailed La Concha Resort Review. 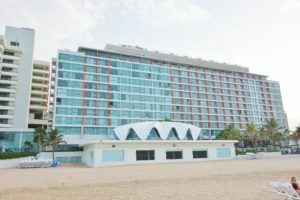 There are a few hotels near Adventure of the Seas’ departure point, Pan American Terminal 1, but we were looking for a hotel on the beach. Plus, we wanted to be on Ashford Street, in the Condado hotel district. Having been in San Juan not too long ago, we were armed with some locals’ recommendations, and La Concha Resort was on the top of the list. From the San Juan International Airport, we got a taxi for a flat rate of $15 to this area of the city, plus $1 a suitcase. Now the Princess’ over packing is costing me even more money! La Concha does not offer a shuttle to and from the airport, but not many of the hotels we looked at did either. The ride was quick, probably 15 minutes or so, including a stop for our taxi driver to check the air in one of the van’s tires. Pulling up to the hotel it was rather busy, with hotel staff assisting arriving guests like ourselves. After 10 hours of travel time, we were ready for a little rest and relaxation. 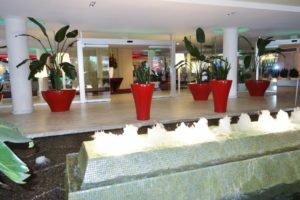 Before entering the hotel, a small water fountain welcomes guests creating a tranquil feeling. It was exactly what we needed for our pre-cruise stay! 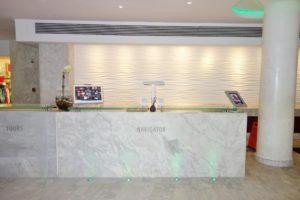 Entering the hotel, the lobby and guest services area is very open and inviting. Neutral marble and stone flooring and structures with pops of decorative color give this area a warm and sophisticated tone. 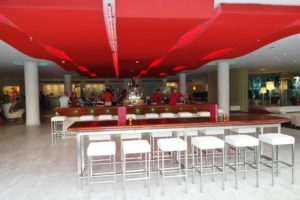 The large lobby bar is directly in front of this open area, and it is definitely a place to meet and mingle later in the evening. In the morning, the bar also offers an a la carte breakfast with coffee, fruits, and snacks for travelers on the go. For those needing their caffeine fix, there are also at least two Starbucks located within walking distance to the hotel, so of course the Princess made me get up early that next day to grab us some iced lattes before embarkation. Off to the right of the lobby, you will find the guest services and the “Navigator” desks. Similar to a concierge, the Navigators help travelers make dinner reservations, plan and book tours, and provide maps and/or other advice for things to do in the area. We were checking in right around 4:30pm, so both desks were quite busy, but the staff was quick and efficient in assisting guests. 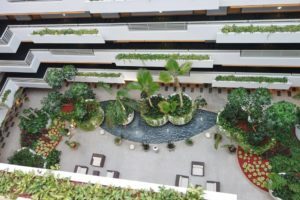 We waited about 10 minutes, and we were checked-in and given our room keys to floor 7. Our family, who had checked in separately earlier in the day, was in the same tower a few floors above us. Also off to right immediately upon entering the lobby is the casino. You can access the casino directly from the street as well. We did a quick walk through the casino before heading out to explore Ashford Street a bit later in the evening. 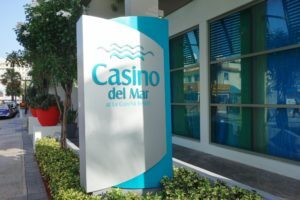 It is a rather small casino with a mix of slot machines and some table games, which had a few gamblers and felt a bit cramped. I couldn’t tell if those playing were locals or hotel patrons. Either way, they did not have the wife’s favorite slot machine, and I was not in the mood to lose money on the first day of our trip. Traveling with family, we needed a room category that offered a king bed for us, and two double beds for our mother and sister who were sharing a separate room. Looking over the room categories, the 1 bedroom suites offered both types of bed setups, so we booked two of these rooms. 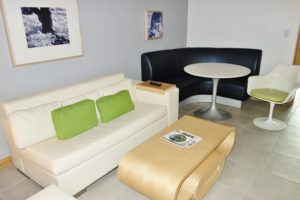 These rooms are located in the Suite Tower, which continues the trendy styling and features its own mini lobby and direct access to the adults only outdoor areas. For our one night pre-cruise stay, the 1 bedroom suite was $199, plus taxes, which was only $20 more than the lowest category room. Definitely worth the extra money to get these larger, 580 square foot rooms. Entering this 1 bedroom suite, you are greeted with a large living area complete with plenty of seating options and a table. 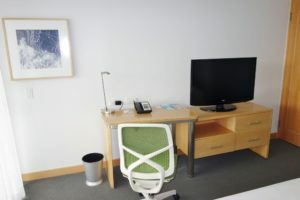 This area also has its own flat screen television, so families or travelers can use this space for work or leisure, while others sleep in the separate bedroom behind this part of the room. The muted colors and clean lines found in the lobby design were also translated to the room setup, decor, and furniture. 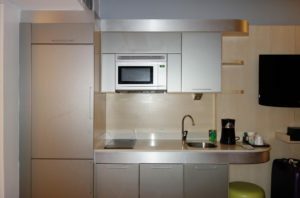 The room also includes a kitchenette that has a refrigerator, stove top, and microwave. There is plenty of storage, and the room comes stocked with cookware and utensils. The setup is great for travelers spending a few days on the island, as it has all the comforts of home. For our one night stay, we packed the refrigerator with water and Gatorade, but that was the most we used of these kitchenette amenities. Progressing further into the room, the bathroom is located off the hallway separating the living and sleeping quarters. 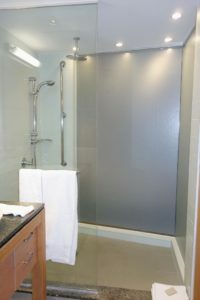 This bathroom has a beautiful, over-sized walk-in shower with a rainfall shower-head, a separate space for the toilet (with a door), and plenty of space-unlike a cruise ship bathroom! This bathroom definitely gives you that resort feel. The sleeping quarters featured a comfortable king sized bed and a pretty standard desk and flat screen television. This bedroom area was very spacious providing plenty of room to settle in for an extended vacation stay at La Concha Resort, but unfortunately, we were only here for one night. Our room also had a balcony, but given its location, the view was of the city. This was fine for our one night, but travelers spending more time here might want to opt for a more scenic ocean view, beachfront room. As great as the room and indoor spaces are at La Concha Resort, the real show stoppers are the outdoor spaces. Right next to our tower was the adults only infinity pool. I was able to snag a few pictures of this busy area early in the morning, before other swimmers and sun bathers were up for the day. Don’t worry- if you are traveling with a family, there are two other pools on the resort that are kid friendly. 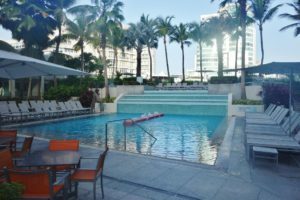 The main pool, located off of the lobby, is a multi-tier pool providing plenty of lounge chairs and pool space. At the top of this area are two whirlpools; although given the close to 90 degree heat, I’d rather take a dip in the pool. 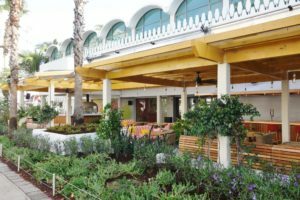 If you get hungry while you are basking in the sun near the main pool, you have a few dining options including Solera, which offers snacks during the day and a full dinner menu in a casual atmosphere with al fresco seating. We contemplated dining here during our stay, but given the heat we opted for an indoor venue. A third pool, open to all travelers, is the Sereno Pool with a more relaxed vibe. This infinity pool overlooks the ocean, and is located next to the Sereno Bar and Grill, for those looking to escape the crowds at the main pool. And, don’t forget the beach! For those looking to reconnect with the ocean, this is where you want to be. 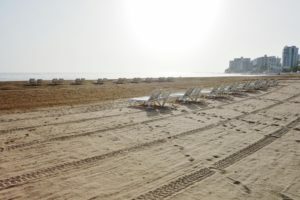 The beach stretches the length of the resort, and there appeared to be plenty of lounge chairs available. Towels are available pool side for you to bring to the beach. Of note, remember to bring your key card to the beach as you will need to swipe at the gated areas to re-enter the resort. This level of security is presumably to make sure that only hotel patrons have access to the amenities offered at the resort. Along with the aforementioned outdoor restaurants and the lobby bar, La Concha Resort offers plenty of other dining options. Perla, their signature restaurant, is a waterfront seafood restaurant with a uniquely designed clam shell exterior. We did not get to tour the inside, but this restaurant comes highly recommended for those who enjoy seafood. Unfortunately (or luckily, depending on how you look at it) the Princess and her family are not big on seafood, so we did not dine here. Looking for an indoor restaurant, for some much needed air conditioning and a more diverse venue, we decided to have dinner at Serafina. This Italian inspired restaurant was not exactly what I envisioned for our dinner in Puerto Rico, but we were tired from traveling and a bit stressed that Hurricane Danny was impacting our cruise itinerary, so the close and casual dining option won out this evening. We ordered a few appetizers to split, and I tried a Medalla, the Puerto Rican beer (tasted similar to a Budweiser). The service was a bit slow initially, but once we ordered, the food was very prompt. The Chicken Caesar salad was actually my favorite app of the night; it was very tasty with fresh pine nuts and sun-dried tomatoes- and a rather healthy option in preparation for a week of eating and drinking onboard Adventure of the Seas. 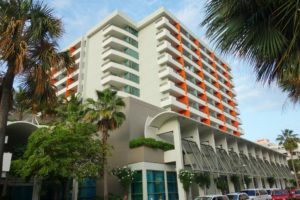 For our one night pre-cruise stay, La Concha Resort was the perfect mix of location, amenities, and price. 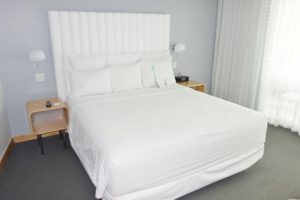 For travelers looking to be in the middle of the night life, this hotel is within walking distance to many restaurants and lounges in the happening Condado area of New San Juan, not to mention all the great dining and lounge areas located within the resort itself. For those looking to relax and prepare for their cruise, this hotel’s pool areas and beautifully combed beach are the perfect hangout spot. Offering full service restaurants, a trendy bar, amazing outdoor spaces, and even a small casino, La Concha Resort has everything you need at your fingertips, making it the perfect pre-cruise stay option. Be warned though, your stay will leave you wanting to return to the resort for some additional days of fun in the sun. 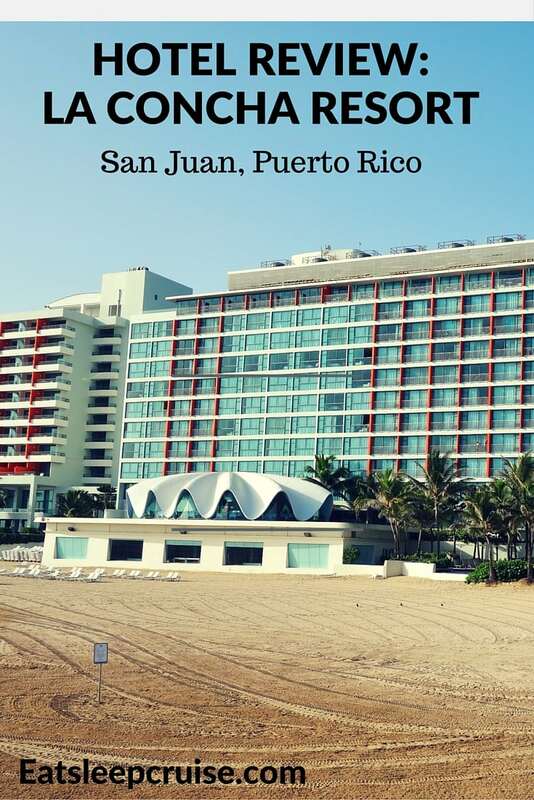 If you have visited San Juan, Puerto Rico, what are your hotel preferences on the island? Have you ever stayed at La Concha Resort? Drop us an anchor below to let us know your favorite resort or hotel on this “Island of Enchantment”. 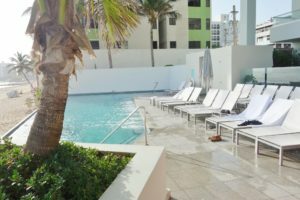 Help your fellow cruisers make the most of their pre-cruise or post cruise stay in San Juan, Puerto Rico. My wife and I stayed at La Concha in January 2015 for a week and absolutely loved it! In fact we loved it so much we’re going back again next month! Thanks Kyle for the comment. 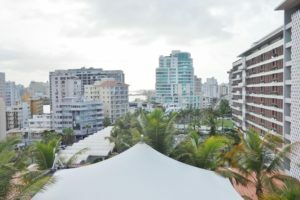 We only got to stay one night at the resort, but we would gladly have spent more time exploring San Juan and enjoying all that La Concha has to offer. Have a great trip next month! We know you will have a good time. Appreciate you reading the post.